Nanette, I absolutely love your quilts. I agree with you yellow and red are a favorite combo. Thanks for the show and tell. 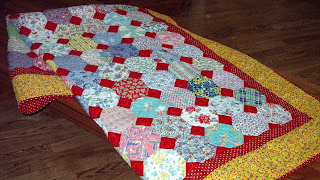 well nanette....i love this quilt.....lessons learned and all it's suppose-ed warts....these are the best kind.....a sense of happy home-e-ness immediatly comes over me..........and way to go shelbie!! 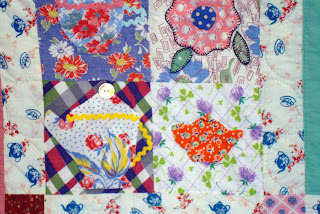 How wonderful to have a quilt hand quilted by your daughter! 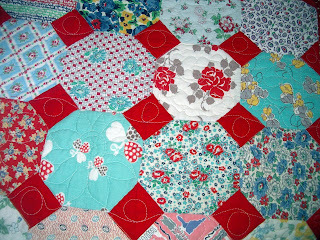 Oh I do love the snowball quilt with the red squares. Very striking. I don't know about anyone else but I certainly noticed the teapot and teacup!!! Very pretty Nanette. 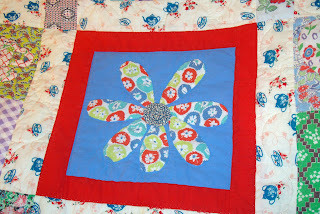 I especially like the red and turquoise quilt but the other one has such special memories for you! You are so right that every quilt tells a story and thank you for sharing part of the story behind this one with us. I also feel every quilt is a learning experience whether you already "know" that lesson or not, it's still nice to have a refresher course! Lovin' that snowball quilt Nanette! Good lessons learned on the second quilt, which still is quite charming! your quilts are fabulous! I love the snowball one with the pops of red. I just love red and yellow together. 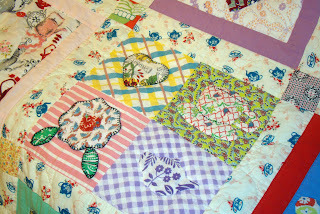 I love any vintage quilts and vintage fabric. I love that your daughter quilted it by hand for you! Your quilts are gorgeous. Thanks for the cottage tutorial. I just found it linked from another blog. They are so cute. I will only make one....just one. Madly in love with your feedsack quilt, Nanette! And I love how you thought of me! If you ever find this quilt missing... just look for the trail of threads that lead to the Oregon coast. 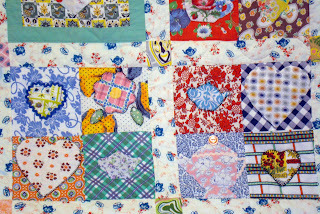 Thank you for the great story about your quilts.. especially the one that your daughter quilted. I still have not goten brave enough to cut up my feedsacks to make a quilt.. I guess I'm saving them for when I am r-e-a-l-l-y ready to do it! Love all the tea cups and pots. You can see them. I love your feedsack quilts, especially the one set off in red. This was a very informative post as well! Thank you! I am in love with the snowball feedsack quilt. It is gorgeous. And I really like your 'learning' quilt as well. It has a sweet story behind it and makes me smile to look at it. I love the snowball quilt with the yellow border. Red and yellow look so nice together. 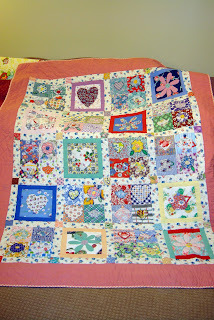 Thank you for posting the photo of my quilt top on Friday. It's quite an honor to be part of your blog! Sometimes you can have 10 perfect quilts but the one with the few 'imperfections' make it feel warmer and joyful and carefree, thus it becomes our favorite just because it's not perfect. They say that we are our own worst critics and I guess 'they' are right. We are all guilty of picking our work apart. But as I think it's beautiful and charming and I love it. Nannette so pretty who would know???? The red and turquise is a big hit with me too!! Gorgeous quilts. I really love the snowball one. One could spend hours looking at all the different fabrics in there! WOW you've got some great quilts there. Thanks for sharing. I really like that snowball with the turquoise and red! WOW! Your quilts are great! I love the feedsack material too! I love your snowball quilt; the red and yellow stand out so well. These are FABULOUS!!! Thanks so much for showing them. You are SO talented. You do fabulous work. I also love the red and yellow in your quilt. Your quilts make me want to learn to do it (like I need another project)! I love how those tiny red blocks set off the feedsacks. Your feedsack quilts are just amazing Nanette! 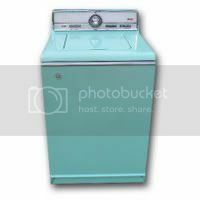 I love the color combo of the first one too, aqua, red, yellow.... I had no idea what a color junkie I am until just recently!! I am in love with all the quilts you show, but especially the snowball quilt. The red between the snowballs just makes the quilt! Beautiful!! Thank you for sharing them with us.